Sifu Tori Contreras started training through ACTIVSTARS under Sifu Mark Steuver, the first and only American Shaolin monk. After twelve years of training, she received her first black belt out of her home dojo in Yuma. 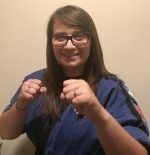 After graduating high school, Sifu Tori is continuing her education at the University of Arizona. Sifu Tori accompanied her instructor on a trip to China. She spent two weeks studying under a Shaolin monk in the ancient buildings of the Shaolin Temple. She learned two katas from the monk and even performed them for the Abbot at the conclusion of her stay. He gave her a certificate of official training completion and a blessed dagger. Sifu Tori may be in the newest generation of ACTIVSTARS instructors; however, she is not new to teaching. She has over six years of teaching experience. "We love the different levels, and our star looks forward to each semester where she gets to learn something new. Pom tryouts were a nice touch." "The best thing any young cheerleader can do to get ready for their school’s cheerleading tryouts."